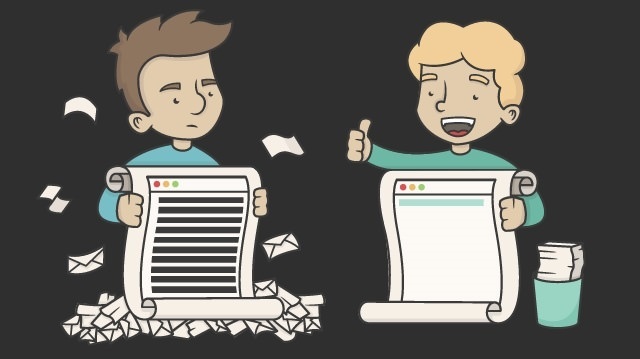 THE TECHY ADVISOR: Unroll Me! Our latest installment of our biweekly blog will be dedicated to covering the latest apps and other technologies that make our lives easier! We like to test out the the most current, innovative, and simple ideas on the market so you can discover what would work best for your life. This week we would like to cover a new app, Unroll Me, which is a way to unsubscribe to unwanted email subscriptions and clean up your inbox. We know better than anyone that it doesn’t take long for your inbox to become an overflowing trashcan of junkmail. Whether you use your email for work or for school, it can be very distracting to open your inbox and see *SUPER DELUXE SALE OF A LIFETIME! * mixed in with an email from clients, professors, or other important cases. 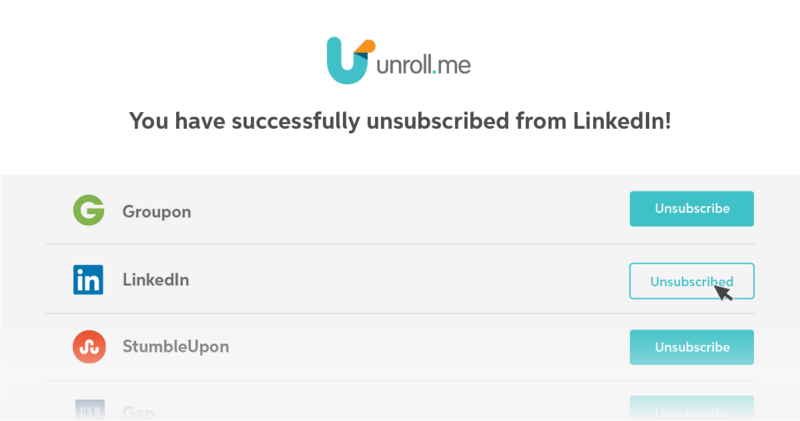 We decided to test out Unroll Me and see if it claims to do what it advertised. Mackenzie, our assistant, decided to use it with her gmail account. Splattered on the account was unwanted spam from many new sources such as Amazon, random clothing sites, and her illusive subscription to Banjo Hangout. Above is an example of how to unsubscribe to accounts. After assigning an email account, Unroll Me runs a full evaluation and comes up with a list of your subscriptions. You are then able to select which ones you don’t want to see when you regularly log in to your email. From here, these particular subscriptions will appear in their own folder titled ‘Rollups’, which you can access if you wish to ever see them at any point. Depicted above is the Rollup Preview folder that will appear in your inbox, housing the unsubscribed accounts. 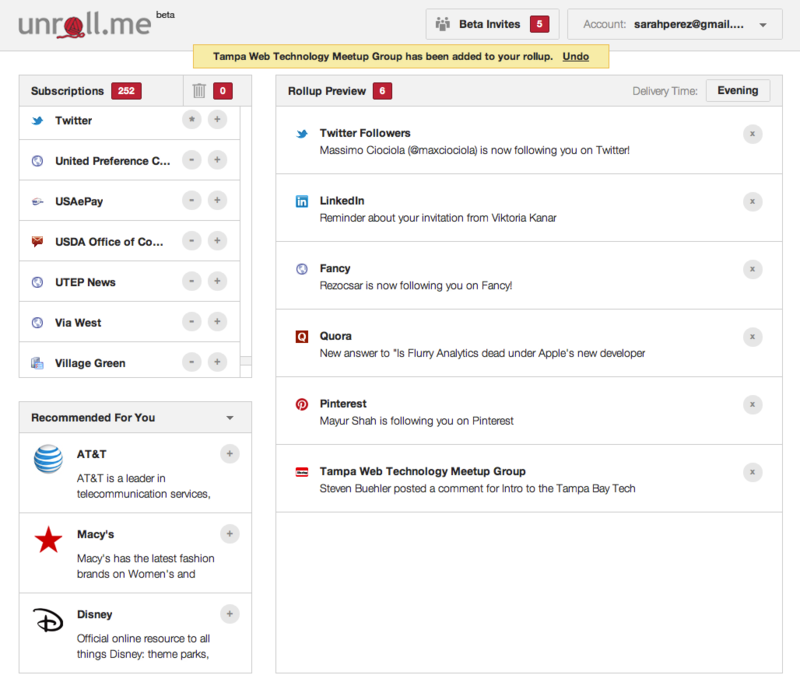 Overall, we were very pleased with Unroll Me, as it makes your inbox more manageable. It seems to always raise your blood pressure when you are flooded with millions of unnecessary emails, so this makes life easier and less stressful for the office-bound.